reconstruction of four mastaba tombs. The earliest graves were pits cut into the bedrock and covered in stones—but soon they developed into more elaborate structures made from mud brick and stone, featuring rooms designed so that people could enter and pay their respects to the dead. These structures became known as mastabas, from the Arabic word for “bench.” All of the early pharaohs of the first two dynasties were buried in mastabas. 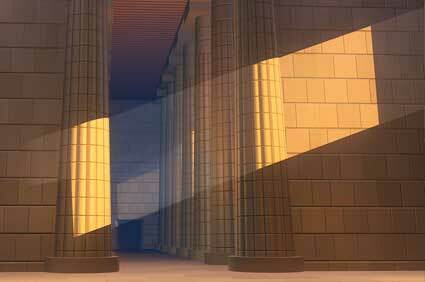 This all changed during the third dynasty when King Djoser (2667-2648bc) began work on his mastaba tomb at Saqqara. The man responsible for carrying out the project was Djoser’s Prime Minister, Imhotep. Imhotep is credited as the inventor of building in stone and was a man of many talents—arc hitect, physician, master sculptor, scribe, and astronomer. He may be the first true genius in recorded history, and his impact on Egyptian life and custom was profound. He was later deified as the god of wisdom and medicine. Djoser and Imhotep decided to build an enormous mastaba of stone, but at some point during construction they built another mastaba on top of the first—and then another on top of the second. 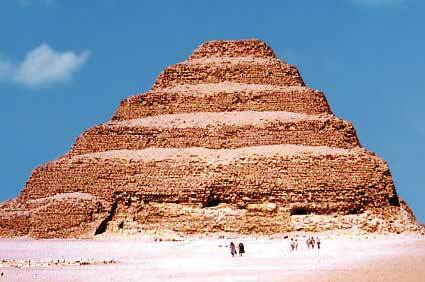 They continued this process until they had enlarged the structure into the world’s first pyramid. 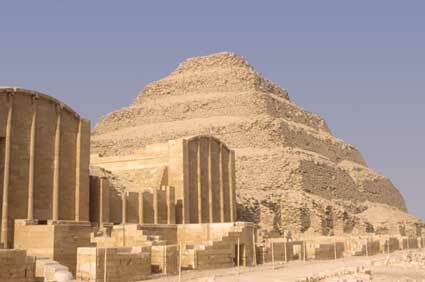 It was what we now call a “step pyramid,” consisting of six terraces some 200 feet (60 m) high. But the king and his inventive architect did not stop there. Next they encased the surface in smooth white limestone, which must have caught the sunlight and reflected its rays. They built chapels around the base, and a vast courtyard for the king’s festivals. Finally, the whole complex was enclosed by a wall. 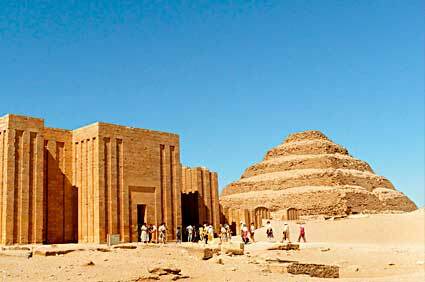 Saqqara is also the site of many tombs of minor royalty and court officials. These are known as “the tombs of the nobles.” The limestone walls of these structures are delicately incised with images showing all kinds of animals, fish, birds, insects, vegetation, and people hunting, herding, and farming. Some of the pictures still retain their original paint after 4,500 years. The quality of these compositions is proof that the ancient Egyptians quickly attained an artistic culture of a very high order. The sophistication and excellence of their artistry and architectural craftsmanship reached their apotheosis in the development of the pyramids. Cattle Crossing (etching) Some of the loveliest works of art I have ever seen are to be found at Saqqara, in the tombs of the nobles. The limestone walls are delicately incised with myriads of animals, fish, birds, insects, vegetation and people – hunting, herding and farming. Some of the forms still retain their original paint, after 4,500 years! The quality of these compositions demonstrates that the Egyptians had attained, at an early stage, an artistic culture of a very high order. The mystery of Egyptian cult temples explained, illustrated with videos, photos, drawings and 30 highly detailed computer generated reconstructions.